Grocery Shopping…But Not As We Know It! Last weekend I took a trip to the Hills to the town of Mundaring 45km away… to go shopping. Not just any kind of shopping, mind. 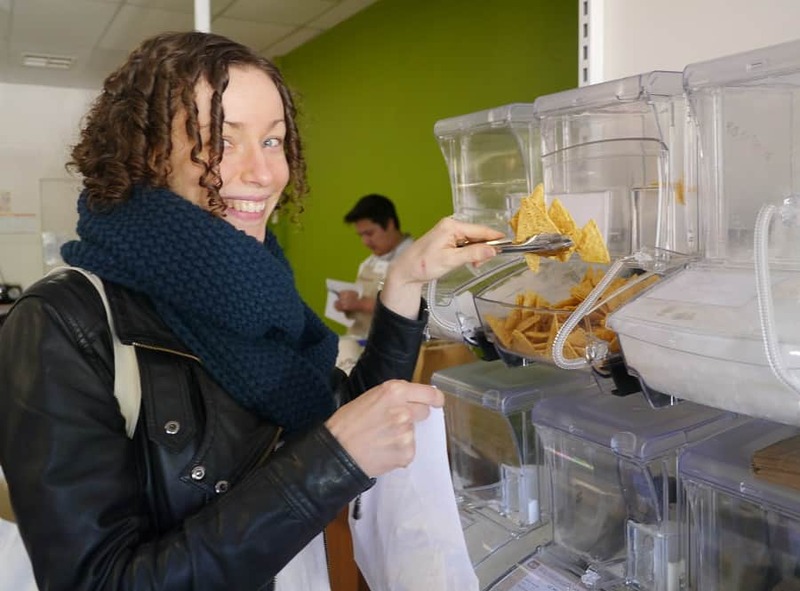 I went to visit a newly opened shop named the Wasteless Pantry. No prizes for guessing what kind of shop it is! 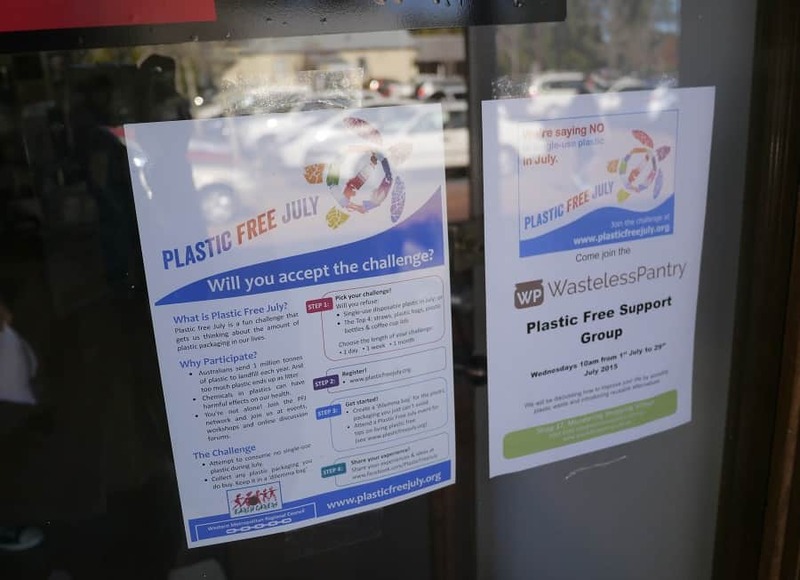 It’s a new bulk grocery store that only sells loose grocery items, actively encourages shoppers to bring their own containers and even offers a Plastic Free July support group! I’m lucky enough where I live to have a number of bulk produce stores to choose from, but this is the first store I’ve come across that sells groceries and cleaning products solely in bulk and does not offer any plastic bags or plastic packaging of any kind. It is like a dream come true! A set of scales and a marker pen at the door means customers can weigh their own jars and containers. As well as dry goods, there was a selection of oils and vinegars to buy in bulk. 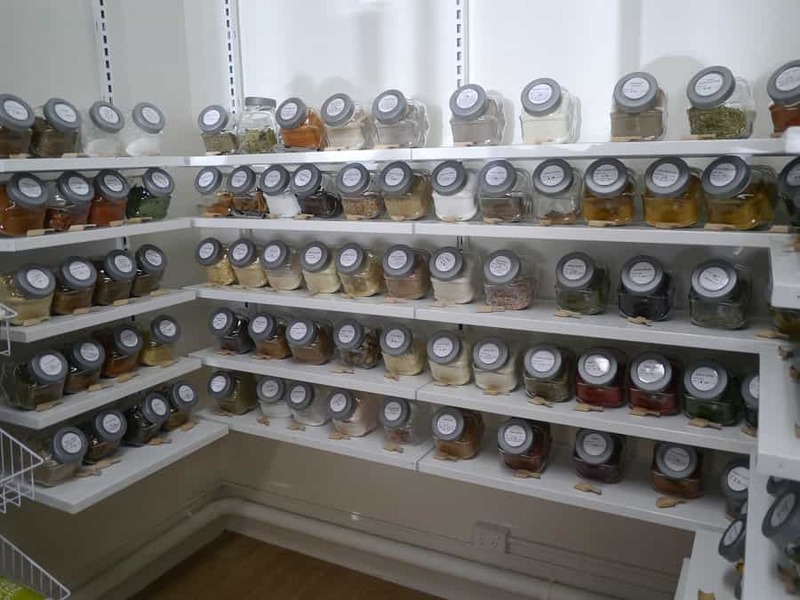 Bulk (plastic-free) spices and herbs can also be found here. The store isn’t big, but is neatly laid out with almost everything you could wish for (and a few things you might not have known you even wanted) all available in bulk. There was also a blackboard on the corner for customers to write their “wish list” of items they’d like to see available in the future. I wrote down maple syrup. I’ve never seen it in bulk in Australia and it’s something I’d really like to be able to source! My favourite bit was the bulk pasta section. I’ve written on social media recently about Barilla’s decision to start adding plastic windows to their previously plastic-free cardboard pasta boxes. Here there was a good choice (including gluten-free pasta) so we stocked up. Bye bye Barilla! Bulk tortilla chips! 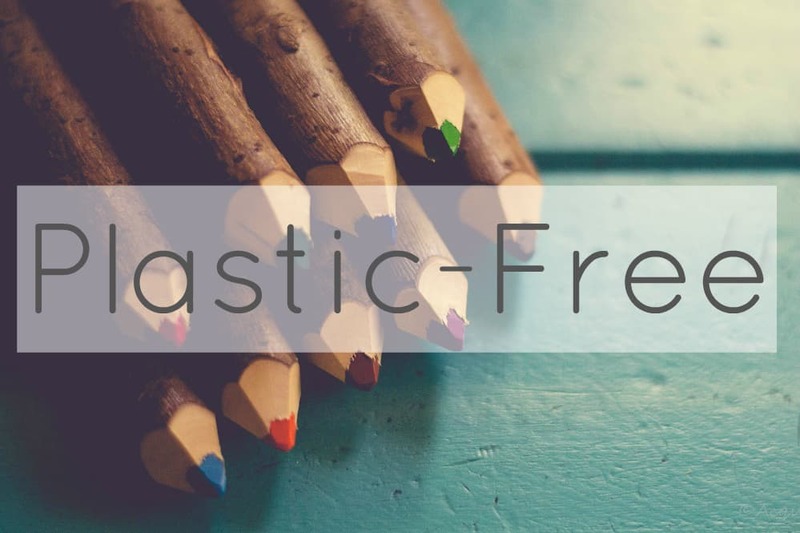 Plastic-free! We bought an enormous bag full and devoured them within an hour of arriving home. To be fair, it was lunchtime. It’s probably a good thing that these aren’t commonly found in bulk stores! If that isn’t excitement then I don’t know what is! Hundreds and thousands. Not something I’d buy (just look at all those e numbers!) but quite impressed that it was even possible. I’m also loving the little wooden scoops that accompany all the spice jars! A little bit of upcycling: funnels made from old plastic milk bottles. Upcycled milk bottles as funnels to fill your own containers…repurposing at its finest! Free bottles and bags, just in case you forgot your own or didn’t quite have enough. The store also sells new glass jars but I love the fact that they make old ones available to shoppers too. No Bulk Stores Near You? Don’t Despair! I didn’t write this post to gloat. I know that lots of you don’t live close to bulk stores. I’m lucky that I have so many close by to where I live, although this one doesn’t count – a 45km trip without a car makes this too difficult for regular shopping. Instead, I wrote this post to give you encouragement. This store only opened its doors on 1st June…that’s less than 4 weeks ago. 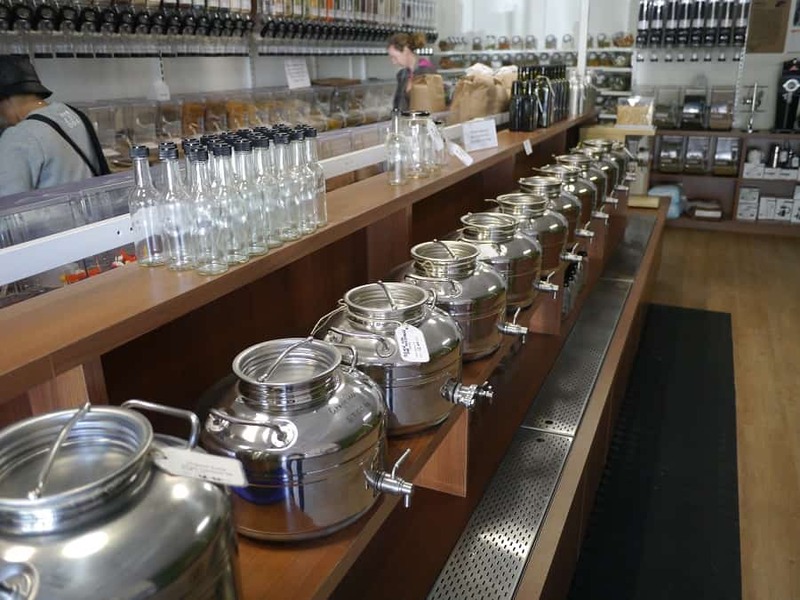 Bulk and zero waste stores are popping up more and more…it’s a growing trend! 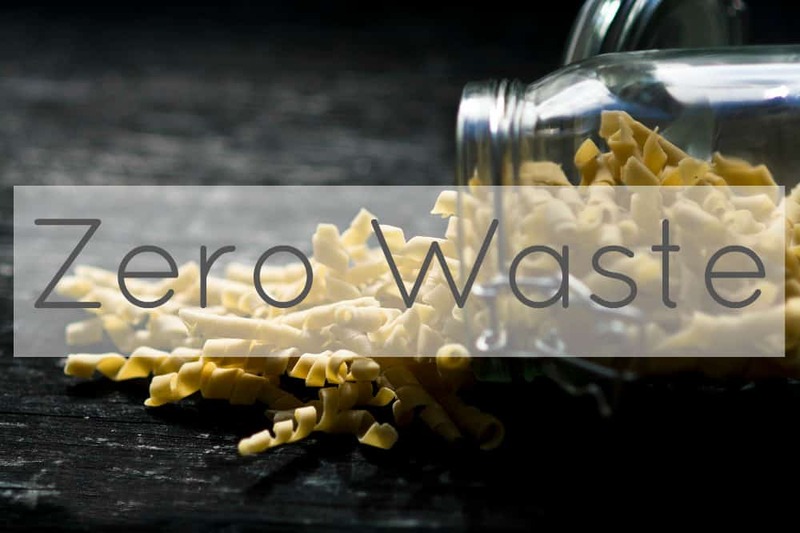 The Wasteless Pantry is the result of two women who were frustrated with the amount of waste they were consuming – and decided to do something about it. Doing something about it doesn’t mean you have to open your own shop (although I know a few of you secretly – or not so secretly – harbour such dreams)! This might be at the more ambitious end of the scale, but we can all do something. Just because you don’t have a bulk bin store at the end of your street, it doesn’t mean bulk shopping is out of reach. 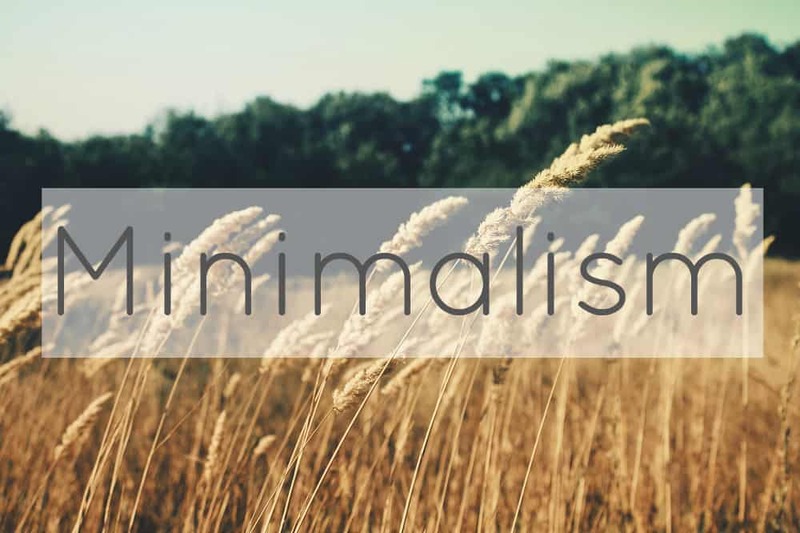 Don’t make the mistake of doing nothing simply because you can’t do everything. The fact that these shops exist mean that products are being sold in bulk. Most products are sold in bulk. All you have to do is find them! One approach is to ask producers and farmers directly. They may sell to you or they may not – but the question must be asked if you want to know the answer. Think about bulk buying groups. Food co-ops exist in many areas, but they don’t advertise so you’ll have to seek them out. Start small. Choose just one item. Think of items you get through large quantities of, or items with a long shelf life. Investigate local producers or suppliers. No-one can do everything. But everyone can do something. 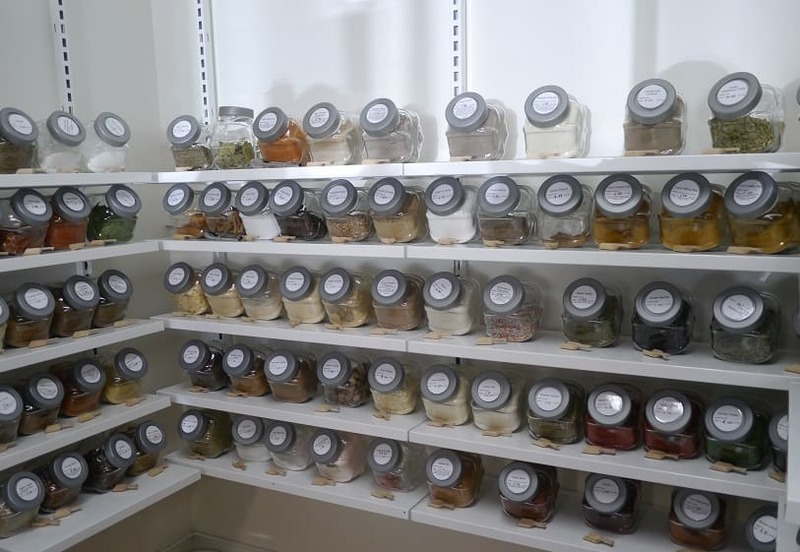 Of course, if you’re inspired enough to start your own zero waste store, go for that instead! Now I’d love to hear from you! 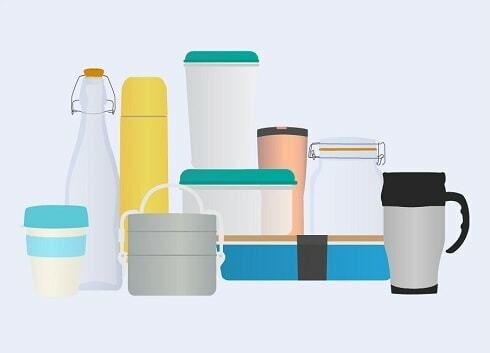 Do you have bulk stores near you, or do you struggle to find anything not packaged in plastic? Have you joined a food co-op, or found a Farmers market or producer that you can buy products without excessive packaging? What is your biggest frustration…and your greatest triumph in the war against waste?! Please tell me your thoughts in the comments below! 24 Comments • Leave a comment! 24 Responses to Grocery Shopping…But Not As We Know It! It’s so fantastic to hear about this store opening (and I’m surprised but really, really impressed that they had gluten free pasta). I’ve added this shop to my to-do list when I’m back in WA in September! 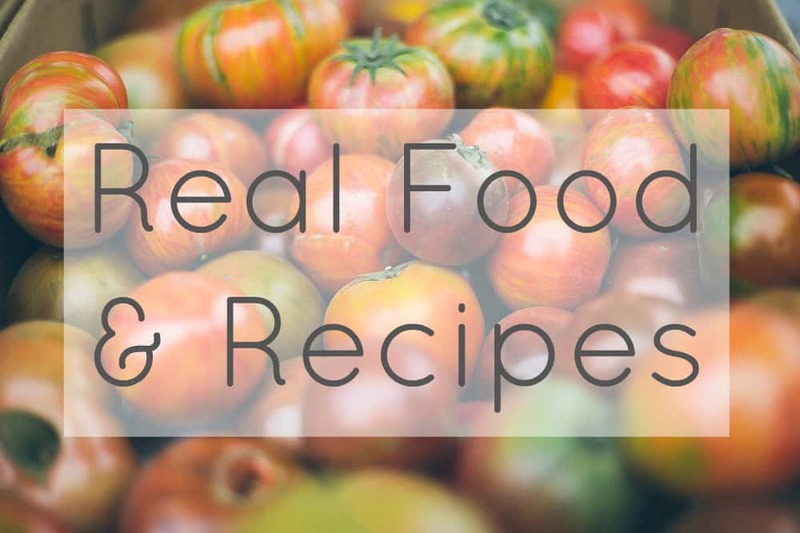 We have recently discovered a couple of local health food shops that sell in bulk and a few stalls at our farmers market that do the same with all Australian produce. Just this weekend we bought a heap of glass jars and containers and filled them after a trip to the market – not only are we living with less waste, but I can’t believe how much more organised our kitchen cupboard is :). Good work on the pantry front! I agree – it’s so much easier to see inside jars, they stack (which packets obviously don’t), you tend to buy what you need rather than what’s on special – so many great advantages! I absolutely love the uniformity of the bulk bins in these newer stores (and there’s at least three I’ve seen lately in Sydney too). But the funny thing is, with things like corn chips, they need to be in a HUGE container, given the ‘usual’ quantities bought, which then (may) ruin uniformity. My coop where I was strongly buying bulk, isn’t as clean lines, and I think it is a small part of why I don’t go as much anymore. Shame, but honest. Also, prices, being fair trade or non GMO does make things a lot more pricey, and it’s also not ‘near’ where I get other items. That being said, when a spice sachet runs out at home, I won’t buy a new one, but refill, at the coop. So it’s like I had gone too far in the zero waste/plastic free life to sustain it, and now have scaled back to a level I can do day to day. Sometimes, i think it’s a shame, but mostly, it’s better to do some things right, if not all. Definitely better to do some things right than do nothing! I know I’ve commented before about my frustrations with not having a full bulk store locally. We have a couple of health food stores that sell bulk spices and dried fruits. They looked at me a little oddly when I bought my own container, but they agreed that I could use it. They did have trouble filling it without spilling- the definitely need some of those funnels and scoops! I am meaning to check out my local markets more, but generally the times they are on are not convenient when you are working etc. I saw a programme on food in Australia recently and I was drooling at the Farmer’s Market they showed- the range of fresh fruits and vegetables was incredible. People were actually racing to be first through the gates. I think it’s a sage reminder to do what we can- even if that takes a little time to arrange. At first, I struggled with trying to do everything! It’s a lovely feeling to walk into a store like this and know that they “get” you! There are few bulk stores around but sometimes the staff are really confused that we want to use our own containers! I think spices are a great one to buy in bulk because the amount of packaging you get for 20g of product is quite ridiculous! I was guilty back in the day of using a plastic bag to pick up two tablespoons of cumin seeds from a bulk store – cringe! Not any more though! Farmers markets are great, but because they have such local catchments they vary of course. I’ve got some great ones near me, but that doesn’t stop me getting “farmers market envy” when I see others on Instagram! Love this store and hope it catches on in more places. I do not have a buik bin store any where near me. The closest I have is a Mennonite run store that sells bulk goods already weighed and packaged in plastic bags. There are a few farmers’ markets around here, but all are a bit of a drive, that do not use plastic although if you don’t bring your own bags your purchases will be bagged in plastic. The best news I can offer you comes from the fact that I was the only one who brought their own bags. One day I had one of my T-shirt bags with me. This sparked a lot of questions from people who saw me with it. Many asked how it worked, wanted to hold it and see if they would like one and I was asked for directions in making their own. These people weren’t just making conversation as I’ve seen several people carrying t-shirt bags with them! All it takes is to plant the image and if it’s a good idea people will want it too. I love it too… I keep wondering if that’s my calling – to set one up in the community we are moving to at the end of the year! Ah, we’ll see. I think it would be a lot of work! 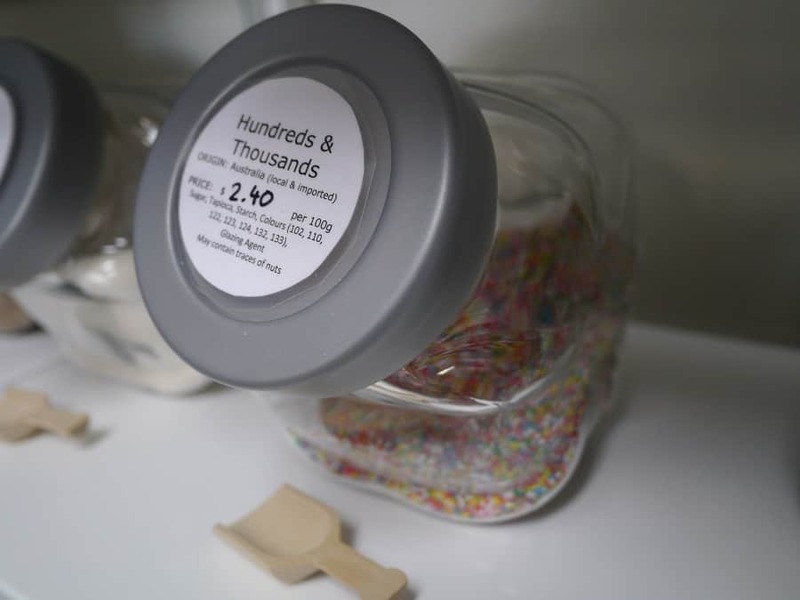 Have you spoke to the Mennonite store about selling in bulk or not packaging in plastic? 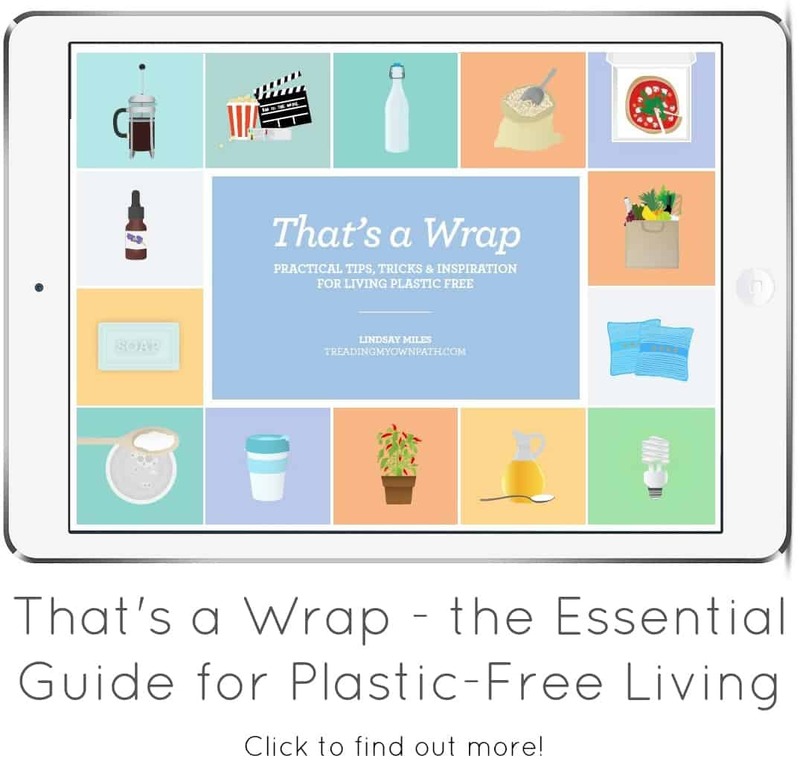 I love that they have a ‘plastic free support group’! That’s adorable! We are super lucky in Melbourne – it is much easier now to avoid the supermarket and go waste free because of all of the fantastic waste free stores popping up – Namely ‘The Staple Store’ in Ripponlea – Heaven to shop at because the owner and staff are so passionate about what they’re doing, not only waste free but everything they stock is locally produced and sustainable and where it’s not it’s because they couldn’t get the best locally – Love it! 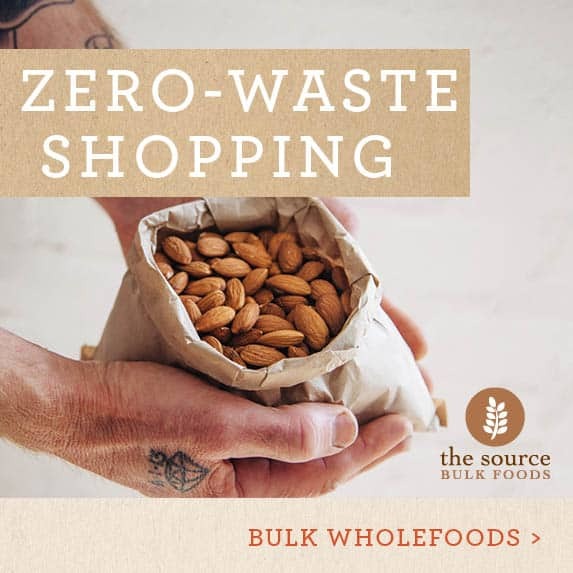 We now also have ‘The source bulk foods’ This one seems to be a franchise – fantastic for waste free – especially things like maple syrup, coconut oil and almond butter however a lot the ingredients are imported but still a definite go to for waste free. It would be good to see the farmers market put a pan on plastic bags as I feel like it wouldn’t be a huge step as most people already bring they’re bags. I love that too! I guess I’m lucky that Plastic Free July started in the suburb where I live so I have the biggest support group of all. 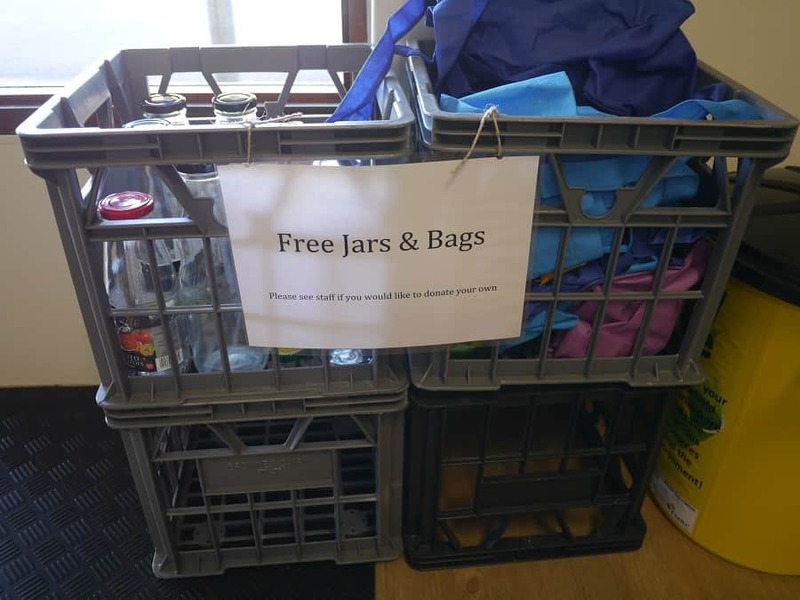 I did a talk on Saturday and one of the things I said about the plastic-free / zero waste movement that I love is the community – on one hand there’s this huge global community and people doing similar inspiring things all over the world, but on the other hand there’s also this super local grassroots community pockets too, because if you live in Perth you can’t have a conversation with a person in California about the best place to buy zero-waste milk! 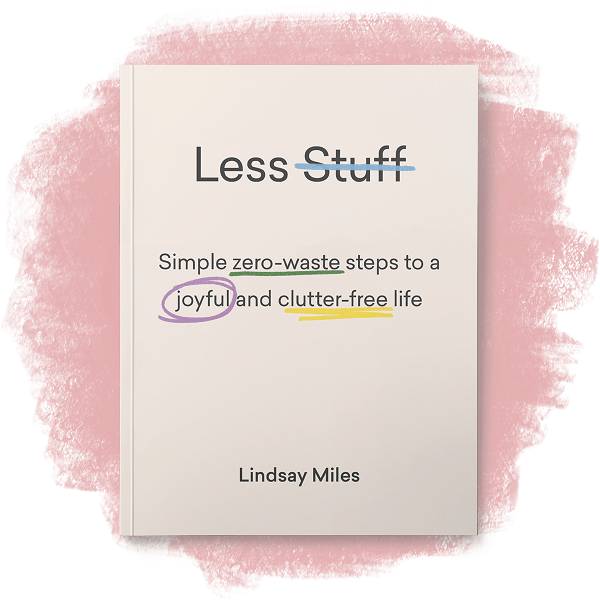 Funny you mention the Staple Store, I’ve been following her on Instagram since forever and I love her message – although I didn’t realise she was really zero-waste! I’m really keen to visit if I ever get to Melbourne! I see those jars “the staple store told me to recycle” often in pictures! 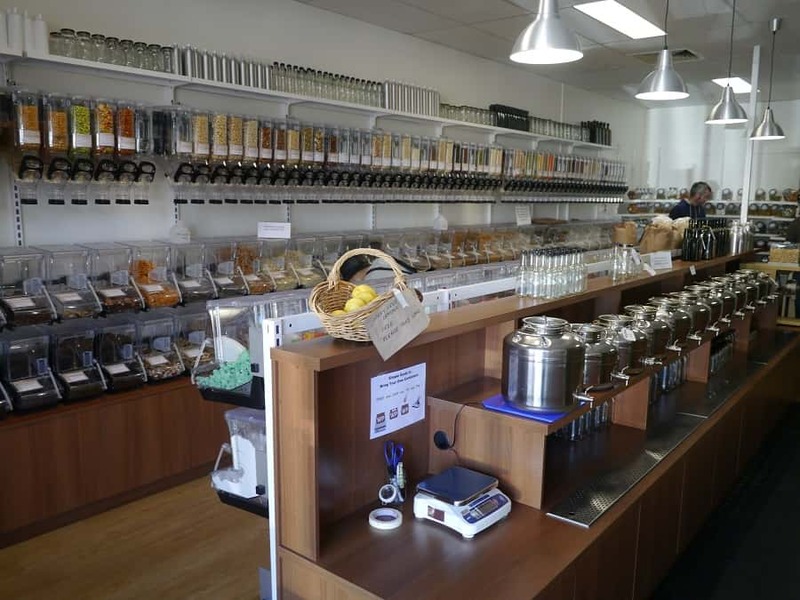 The Source bulk foods – yes I’ve heard of them too, but they aren’t in Perth. Bulk maple syrup…oooooh! Did you ask them how their suppliers package the goods ? No, I didn’t. I saw the big paper sacks of flours, but I’m sure some of the products have some packaging. I know their key motivation for running the store (as you see if you follow the link to their site) is reducing waste so I trust they do the best that they can. I’m sure some of their products come in plastic, but if people then buy the products in their own containers that stops further waste. I would never get through a bulk 20kg sack of turmeric, so I’m happy if they buy products in plastic and sell in bulk so hundreds of other customers don’t have to. Our Whole Foods stores have added a lot of bulk items in the last year or so — oils, spices, honey, tea and coffee, nuts, snacks, chocolates, lots of kinds of rice and pasta — but of course they also still have the regular packaged stuff. Still it’s a nice step forward for a chain. I’m loving the growth in bulk food stores in recent years, it definitely makes reducing waste so much easier. One like this has just opened down the road from me as well and they also have no plastic bags or the like around which is such a great thing to see! Also, I’ve only just come across your blog but I love it already! 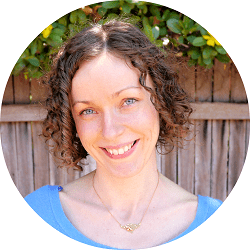 Me too – it makes it so much easier to persuade people that zero waste living is an easy thing to do! Plus of course I like that there is demand for these kinds of shops! Just letting you know you wish is our command – we now have Australian (imitation) and Organic Canadian Maple Syrup in store :) Thanks so much for the beautiful words and it was lovely to meet your group! I’ve stopped buying pasta all together! I have worked out how to make it pretty easily myself using a wind up metal pasta machine. I make a big batch of spaghetti over a couple of hours on a weekend, using bulk flour and eggs and then dry it out on the clothes horse overnight. It lasts for about a month until I need to make another batch. It’s soo tasty! I probably eat more pasta now than I did before. 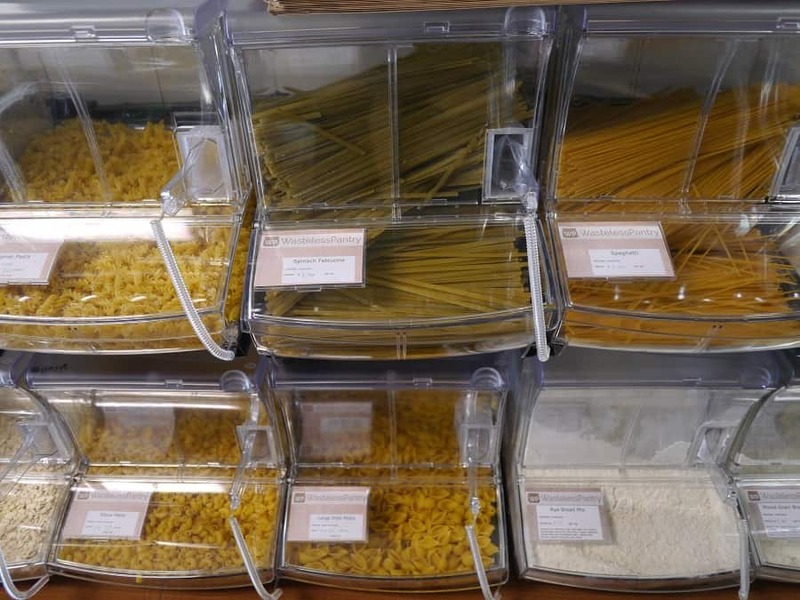 This is a super store, but isn’t the pasta in plastic containers? And the tops on some jars? And the crates? It’s really, really difficult to not have any plastic. It’s nearly impossible in supermarkets. I also make a lot of stuff myself. Pasta I buy from an online, Italian, organic producer called La Vialla. They pack in paper. Yes Jeanie, you’re absolutely right. 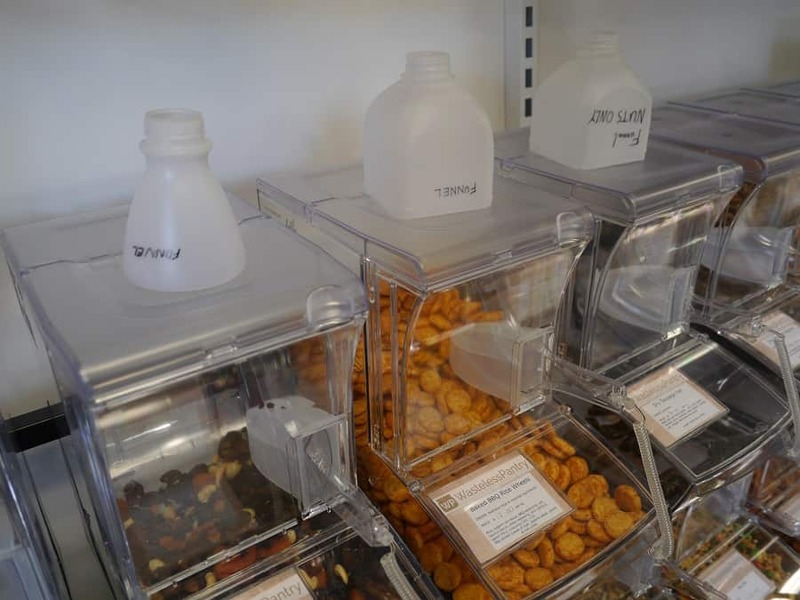 The shop is called the Wasteless Pantry and they are all about reducing single-use and disposable packaging. I guess they had to weigh up storage that was wall mountable, see-through, easy to clean and cost effective. They are a small independent start-up company after all! All their containers are durable and should last a long time. Making the whole thing glass and stainless steel would’ve cost a bomb! I see it that they are using (durable, long-lasting) plastic so others don’t need to use any! I think I’m in love with this store! I just wish we had something like this where we are.